Jute rope is made from natural fiber which has been in use for thousands of years. Jute fiber rope is one of the most affordable and long lasting fiber rope. This rope are soft and flexible. This rope has fine & comfortable grip and it is not as heavy as other synthetic rope. Jute rope has a natural strength, durability and perfect structure for excessive & long term use. It is a linear strands of jute which are braided or twisted together in order to make a larger & stronger form. Due to its ultimate strength, ropes can be used for dragging, lifting, etc. Due to their good hand and ability to absorb perspiration, jute rope is ideal for climbing, construction, gymnasium, playing tug of war and in number of exercise & hand strength building applications,. 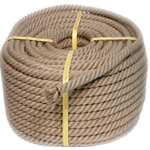 Jute rope is specially designed to stretch under load in an elastic manner. Twisted/ Laid Rope: Twisted rope generally consists of three strands and is normally twisted in right & left handed order. The strands then twisted together to form the rope. Braided Rope: There are two types of braided rope, Single braid and Double braid. Single braid consists of even number of strands, braided in a circular form with half of the strands going clockwise and other half part going anti clockwise. Double Braid: It is also known as braid on braid. It consists of inner braid filling the central bare in an outer braid. That may be made of same material or different material. Plaited Rope: This is made by braiding twisted strands. These are very flexible, easy to handle and knot. Brait Rope: Brait rope is a non- rotating alternative to set three strands ropes with the combination of braided and plaited. Feel free to send you requirement through following form about any types of natural jute ropes, thick jute ropes and hemp ropes.